I had a dream just before I woke up this morning that all the flowers that didn’t make it onto Rose Parade floats ended up at a warehouse for a public give-away. I had some project in mind and went in hopes of scooping up some free flowers. I ended up there on the last day of the three-day event and all that was left were rose stems. No flowers. Just thorns. I know that this dream came partly from an image that stuck with me as we drove by a float building site the day after the parade. In the parking lot under the freeway over pass that I drive by on a weekly basis were several trays of single roses, salmon colored, and each stuck in an individual vial of water. There must have been 100 of them. Next to that tray were several buckets filled with beautiful mixtures of flowers. The float, the volunteers, the busy energy were all gone. For those of you who don’t know, the Rose Parade is a New Year’s Day parade that has been taking place for over 100 years in Pasadena, California. 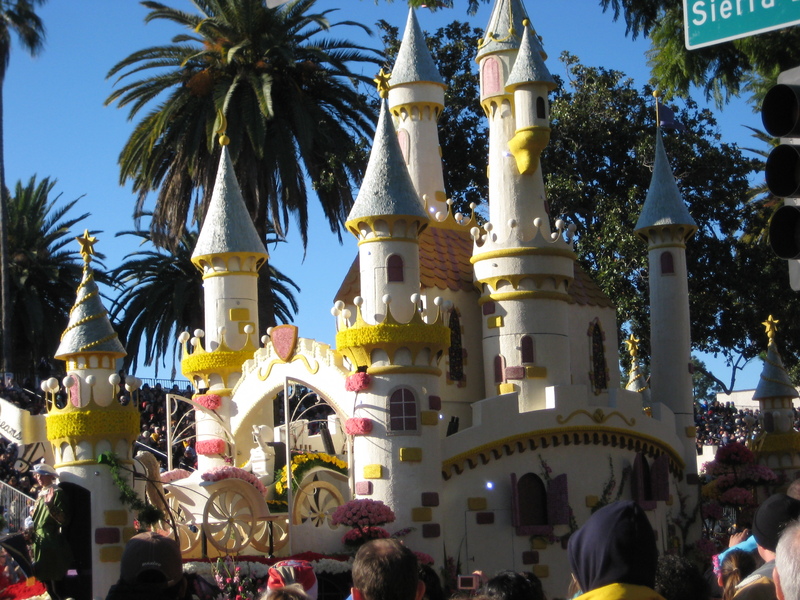 In its modern form elaborate floats are designed and then decorated for the parade. 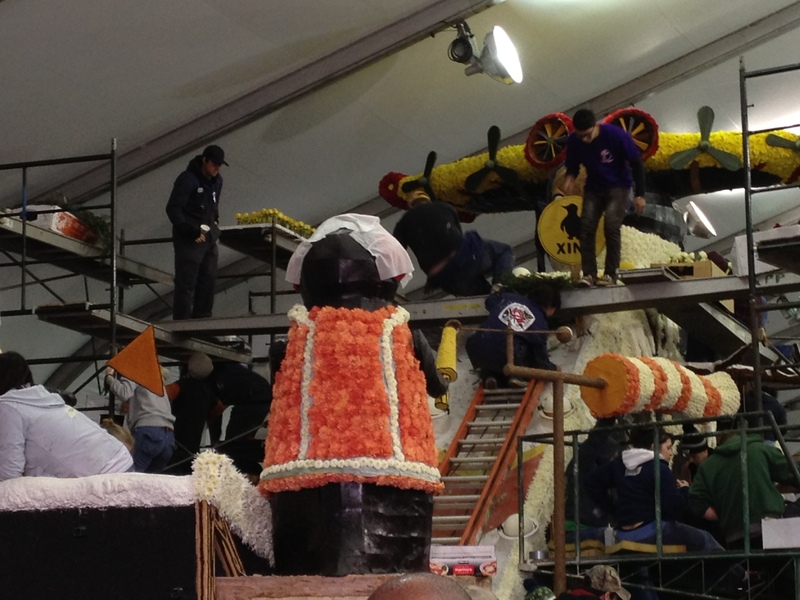 Everything that covers the floats must be plant material. Nothing can be dyed. I grew up about a 20 minute drive from the parade, but only ever saw it on television until recently. Up until a few years ago, my experiences with the parade were sporadic. When I was about 13 I did spend a day gluing seaweed on to a float. While in high school a friend and I accidentally ended up on the parade route trying to get to a party and had a horrible time trying find our way out of Pasadena without running anyone over. I think at one point we just sat in the car and screamed at the top of our lungs we were so frustrated. Later on, in my 20’s, while out walking one New Year’s Eve, we happened upon the floats as they were being lined up for the next morning. For most of my life, I had no real interest in the parade, even after moving to Pasadena (then Altadena). We kind of avoided the whole area until all was said and done. Then, two years ago, sort of on a whim we decided to check it out. We rolled out of bed early and made it to the parade route in plenty of time. The floats are really quite beautiful in person, and I was surprised by how much I enjoyed seeing them. But here is the conundrum. The sticky part. The part that makes the parade not as much fun. So as we were watching the floats come down the street and admiring their beauty and creativity, I had to ask, where do all these flowers come from? Not to mention the steel, wood, and foam that make up the frames. And, what happens to everything afterward? I did a quick search on the Internet and found this article. One float designer (there are whole businesses that do nothing but design and create the Rose Parade floats) said that he places orders for flowers that come from every continent except Antarctica, totaling 400 to 500 varieties, which amounts to at least a million individual flowers. I heard a radio piece that focused primarily on the roses that are used, most of which are grown in Central and South America in green houses. All the fresh flowers (much dried material is used as well) are moved around and stored in refrigerated environments. And who knows what kind of farming practices are used, but my guess is that most of the flowers are grown conventionally. And then, there are the workers who grow and harvest the beauties and get them ready for shipment. The parade is the antithesis of sustainability. I stand there admiring the floats knowing that the represent many things that I think are wrong with how we live on this planet, things that I am doing my small part to change. And so I ask myself, should I stop going? But then, maybe I should stop watching movies too. An unbelievable amount of resources are used to create movie sets, prep on location sites, clothe actors, etc. So, maybe the better thing is to start a conversation about this. At what point to we draw the line and say, this is nice, but how does this affect our planet and the people living on it? And what do we do to speed up the momentum of change? I see those roses and all I can think of is the water lost from the places they were grown. When you start thinking about it, it’s kind of freaky, isn’t it!? I just finished reading a Wes Jackson book where he talked about a study they did on the farm at the Land Institute – tracked how much oil was required to run the organic farm in the “scaffolding” of the culture/civilization, right down to the roads used to take product to market, how much travel the CEO’s of the oil corporations did . . . It’s mind boggling. Freaked me right out. Lots of folks won’t sacrifice things they view as “cultural” even if they are obviously destructive – I think of the shark fin soup debate raging up here in Canada right now. I think we are a long way off for a collective move toward casting off the things like the Rose Parade that are really detrimental to the planet and its people. I can hear it now the voices calling out, “Stop raining on our parade.” But come soon or later, we are going to be forced to have these conversations. I say the sooner the better. The Occupy folks did march at the end of the parade. I didn’t see them, so not sure what their message was. Great post. It’s so important to consider these issues… what is really necessary? We’re in such an age of excess and it just can’t last forever. 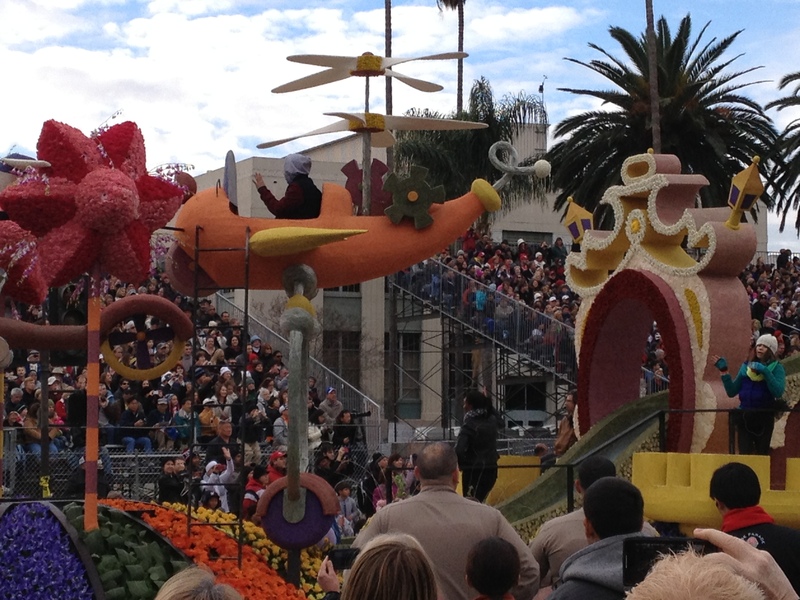 I hope more and more people are considering the implications of these floats (however beautiful they may be). My parents were watching the parade while I was visiting them, and they made some excited comment that one of the floats would be composted. Um, at the VERY least, shouldn’t these darn things be composted?! It’s kind of crazy that that was “big news”. I couldn’t agree with you more. I can only imagine that what is put back into the earth as composted flowers from the floats is far less than what is taken, so yes, at the very least. The age of excess can’t last forever. I just hope we can get a cultural shift before we pass the point of no return. These things may have started out with the intention of being art–but it seems like it’s just a big industry now. I’m willing to sacrifice a lot for art. But I’m not willing to sacrifice much for industry. Here, here. So much of it is big business, like most everything it seems. I guess I would also ask, at what point do we draw a line for art too?